Hey Dude ran on Nickelodeon from 1989 – 1991 and has since become a cult sitcom favorite. The Complete Series, features all 65 episodes of the fan-favorite series. Oh goodness does this bring back memories! This was one of my favorite shows to watch when I was younger. I remember thinking, "I want to work on a ranch too," as I got to watch a group of teenage kids come together while working on a ranch and getting into some type of situation. Fast forward and watching it now, the hubby and I laugh as we watch the first episode. Kids are completely different now. I wonder how a show like Hey Dude would work in today's tech-savvy society. It was great to re-live a moment on a show where there was no Facebook or Instagram. Where kids had to actually talk things out face to face when faced with a problem. It was a great show and I do remember feeling pretty bummed when it ended. If you were a fan of the show back then, you'll be happy to know that you can now get the entire series on DVD thanks to Shout Factory. Disclosure: All opinions are my own. 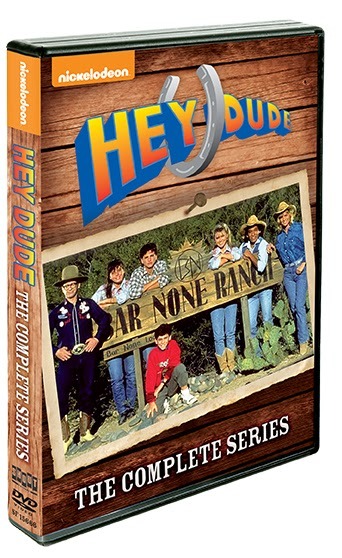 I received Hey Dude: The Complete Series on DVD at no cost for the purpose of this review. No other compensation was received.